For Livepkgr you must stream using AAC audio with H.264 video. Luckily the Mac version of Flash Media Live Encoder comes with AAC for free but equally unlucky the Windows version does not come with AAC for free, though there is a plugin to solve this issue: Main Concept. Download and run Flash Media Live Encoder (link provided above). Log into your Influxis Portal account. Hover over your account name to the right, located directly under the Dev Center link and click on Account Settings. On this page simply copy your_rtmp .cloud.influxis.com. 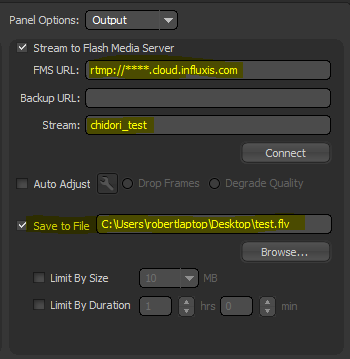 Now, in Flash Media Live Encoder’s FMS URL sections type ‘rtmp://’ then paste in your_rtmp .cloud.influxis.com with ‘/livepkgr’ appended that you have copied from your Account Settings. Next, you need a stream name, so type any name your heart desires; however, you must not use the following in your stream name: no commas, no special characters except dashes and underscores, no spaces and no unnecessary characters. Next, make sure that if you wish to record that you specify an area in which Flash Media Live Encoder will save the file into. Next, you must configure your audio to stream with AAC and your video to stream with H.264. Finally, click Connect and then Start and voila! You are now streaming with Livepkgr using Flash Media Live Encoder.